The USS Hood, one of the special guest star starships in The Next Generation and Deep Space Nine, is an Excelsior class starship and the prize ship for the Encounter at Farpoint OP event. This is a quick little review of the ship and cards that come with it. Not a bad rendition of an Excelsior class ship at all. Some people have mentioned that the saucer section is incorrect (which, in fairness, it is) but still in keeping with the basic design that it doesn't bother me too much. As you can see, the basic statline for the Excelsior class is 3 attack dice, 1 defence, 5 hull and 3 shields for 24 points. The Hood increases the shield value by 1 and in addition adds an extra crew slot and gains an extra attack die vs cloaked ships. For 2 extra points the shield and ability is pretty nice. The nice thing about the Excelsior is the 180 front arc - it may not be able to turn well but the arc almost makes up for it. As a ship in STAW it's comparable to the Cardassian Galor in some respects. As usual a 0 point skill 1 Captain is included, the star of the show however is Robert DeSoto, whose ablility allows you to re-roll a defence die for each crew card assigned to your ship. Natively the Hood only has 1 defence die, but this can easily be added to, to make an exceptionally defensive ship that's going to last a while in combat. He does only have a Captain skill of 4 and no elite talent slot so there are limitations that you may need ot work around to get the best out of him. The Tachyon Detection Grid at a cost of 6 points and a discard is something I don't think I would use unless I know I was facing Romulans or Klingons and could get a discount on the cost of it - it is a very situational card and against most fleets completely useless. The absolute standout card of this expansion is the crew William T. Riker. For only 3 points you can increase your defence value by 1 (2 if your Captain is disabled) and can turn 1 (again, 2 if your Captain is disabled) battlestations rolls into evades when rolling defence dice. Couple this with Desoto's ablity to re-roll dice on defence and the combination speaks for itself. In addition, if you compare him to other Federation crew who do similar things such as Tom Paris - he is cheaper than him and has far more utility. He is fantastic and should have a place on every defensive ship you build. Systems Upgrade gives you an additional shield token and an additional equipment slot - the good thing here is you can place it in any slot type. Again, a really useful upgrade - you could use it on the Enterprise-D to give it that missing equipment slot and an additional shield token for the bargain cost of 2 points! 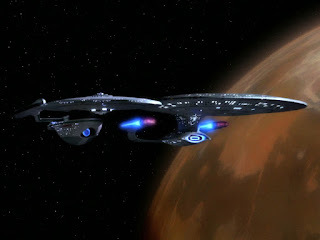 The Type-8 Phaser Array can only be used on ships with an attack value of 3 or less, that does mean it can be used on the Excelsior class and the Defiant for example to give it a little bit more bite. Again a perfectly costed upgrade and there is no reason to not take it! As a whole this is an excellent pack, only one card is a bit of a letdown and that is only because of the cost. DeSoto moves up to CS5, you get an additional attack vs cloaked ships from the Hood and you can either use Shanthi to get re-rolls on the attacks or use Sulu to give you an exellent defence. Coupled with the -2 damage for the High-Capacity Deflector Shield Grid this should keep you around for a while. Add in another ship that can pass over tokens or target locks and you have a very effective ship with a statline of 4 attack, 2-4 defence with re-rolls and aout-conversion of BS tokens, 5 hull an 5 shields. Hope you enjoyed the review! Until next time! No problem at all ;-) I actually think with the upgrades this could be a good core of a fleet. One of the other prize ships, the USS Cairo, also has some fantastic upgrades - I'm hoping that the local runs that OP at some point!